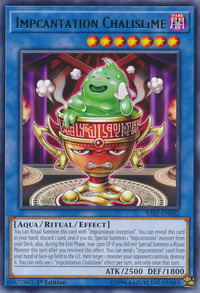 You can Ritual Summon this card with "Impcantation Inception". You can reveal this card in your hand; discard 1 card, and if you do, Special Summon 1 "Impcantation" monster from your Deck, also, during the End Phase, lose 2500 LP if you did not Special Summon a Ritual Monster this turn after you resolved this effect. You can send 1 "Impcantation" card from your hand or face-up field to the GY, then target 1 monster your opponent controls; destroy it. You can only use 1 “Impcantation Chalislime” effect per turn, and only once that turn. This monster appears in the artwork of Impcantation Creator - Crealtar. This monster's initial form appears in the card artwork of Impcantation Inception and Impcantation Secret Study. While the Impcantation archetype as a whole focuses on aiding Ritual Summoning, this is their first actual Ritual Monster. This is the first card to specifically list a 2500 LP loss in its effect.